Professional veterinary teeth cleaning and oral examination are important parts of maintaining your dog's health. We know that providing the best care for your pet is important to you. At Animal Dentistry and Oral Surgery Specialists, LLC; we offer the most comprehensive and state-of-the-art veterinary dental cleanings and exams available. If you ask for this special price offer for teeth cleaning, you can extend this annual teeth cleaning further to a comprehensive oral health assessment and treatment (COHAT). With COHAT (more than just annual teeth cleaning), the treatments will be associated with additional cost. Be assured however, our fees for services are fair and that peace of mind is priceless! Bloodwork - ( PCV/TS or CBC & Chemistry) - Bloodwork will confirm your pet is healthy, and can undergo the dental cleaning procedure. General Anesthesia - We are highly experienced in pet anesthesia. Your dog's anesthesia will be individualized to their specific needs, and will be closely monitored throughout the entire process. *General anesthesia is required for all pet dental cleaning procedures and cases that involve taking radiographs. If the patient has no active periodontal disease, it still requires anesthesia to be completed properly. General Anesthesia - We are highly experienced in pet anesthesia. Your dog's anesthesia will be individualized to their specific needs and will be closely monitored throughout the entire process. NOTE: Blood Screening is required, but not included. Charges for Pre-anesthesia blood work are additional based on fees at the facility. This blood work (CBC and Chemistry) can be provided by your family veterinarian. NOTE: Hospitalization or ICU fees may be a separate charge depending on the location. 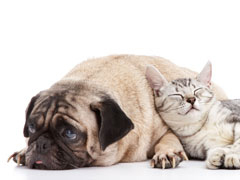 *General anesthesia is required for all pet dental cleaning procedures, and cases that involve taking radiographs. If the patient has no active periodontal disease it still requires anesthesia to be completed properly.